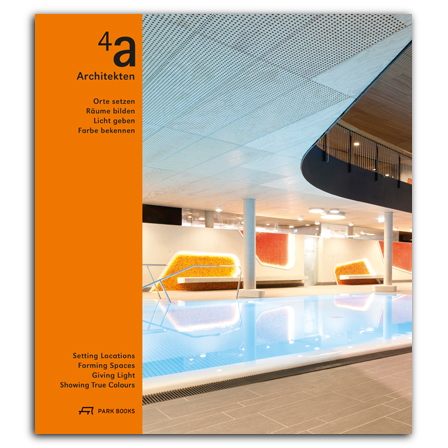 Stuttgart-based 4a Architekten have gained much recognition especially for their public swimming pools and spas. Yet the firm, established in 1990 by Matthias Burkart, Eberhard Pritzer, Alexander von Salmuth, and Ernst Ulrich Tillmanns, has created also a formidable work of cultural and educational buildings, hotels, and housing. Having built mainly in Germany and Austria in their earlier years, they opened an office also in Moscow in 2008 when they obtained their first commission from Russia. This new monograph features seventeen realized projects that are exemplary for 4a Architekten’s approach and vision. The selection also reflects the range of building tasks they cover. Richly illustrated with images and plans, the book also demonstrates the development of the firm’s architectural language. The book is completed with a catalog of all their built and unrealized projects. , born 1951, is a freelance architectural publicist and critic. He has before been chief editor, and 2011–13 also publisher, of German architectural magazine Baumeister. , born 1967 in Russia, lives and works as an author and columnist in Berlin. , born 1968, studied business administration, Russian studies, sociology, and political studies in Berlin and Moscow. She has been head of Public Relations at Germany's Goethe-Institut in Moscow since 2010.
, born 1944, is an architect and has taught as a Professor of Theory and History of Architecture at Staattliche Akademie der bildenden Künste Stuttgart (1990–1994) and Bergische Universität Wuppertal (1994–2007). He has since been teaching as a visiting professor at various universities in the US and Europe and researches and publishes on theory and history of 20th and 21st century architecture.